Recommendations: Sven Figee - Hammond and Saskia Laroo - trumpet are both extraordinary musicians. Check their websites! Website: If you enjoyed this interview with Anne Vanschothorst, you can find more information about her on her homepage, sheet music website or her Facebook profile. It took me actually years to embrace the choice to become a full-time composer and audio-producer with the harp as basis material. When I started to play the harp at age 9, I already liked to improvise. I composed my first piece at age 14 because I did not like a piece of a music trilogy that I had to study for my harp lessons and I decided to create the 3rd piece myself. But that was it for a long time. In 2007 I started composing and producing audio for my indie-label HSM (harp and soul music) professionally because I felt the strong urge to finally follow my heart and I had the need to be in charge of the notes - to be the boss of my own work - in order to excel. ARTfusion is my passion. Music fused with other art forms creates another sound ... motion ... shape ... colour … vision. 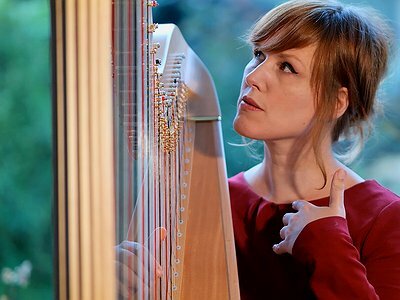 To me there is no greater joy to see and hear how the synergy works between harp sounds and other art forms, e.g. poetry. Music and Poetry are to me the most profound; to be touched by the unsaid. Minimal, meditative music composers have been a great inspiration to me. Erik Satie, Philip Glass, and Arvo Pärt have influenced me a lot. – The awesome Keith Jarrett is such a major inspiration (the art of improvisation) and how I love Pat Metheny and the great Miles Davis and a lot of other jazz music give me energy. I also listen to classical music, like the Bach cello suites as soul comfort. Gnossienes/Gymnopédies played by Reinbert de Leeuw and of course the amazing Bach pianist Glenn Gould who taught me that the left hand has a will on its own and must be expressed in music too ! Nowadays I love to play with silence and I believe in the power of a minimalist note-score to create maximal music. I compose landscape music; subdued and stilled music that reflects the internal and external landscapes we are moving in; a meditative and yet lyrical note-score to create beauty and consolation. In the journey to find my voice I listened to my favourite composers and artists to have a reference. I tried to translate the structure I liked into harp music or I created the opposite melody, rhythm in order not to copy. It is quite a challenge not to notate the exact notes but to be as authentic and original as possible. Later I started to give words to what it was that I liked about a song – and these words - feelings I translated with my own musical voice and reference (in my case with my 47strings). It has become natural to embed the influence of other creatives into my own work without losing my authenticity because I follow my intuition. I have always been an intuitive musician and I do not feel real creative challenges – I trust my gut feeling when it comes to being creative. I am an autodidact composer and maybe that is why I don't feel boundaries that otherwise might have been created by a conservatory. The only boundary is my own imagination and the things that frighten me. That is why it is important (to me) to make mistakes, to learn, to have an open mind and open heart to confront my demons in order to grow as an artist. When I first started I thought I should write everything down as sheet-music. And that was an enormous challenge for me. Because what I hear is most of the time something else than what I have written on paper. I play very rubato so I felt that these bars were almost like prison bars. I have published 2 music-books because I really love it when other artists play my work, they give my music another set of wings and another audience and that is huge. And very soon I realized I should record my work, otherwise I am just playing for me and I really like to share my music with the world. So I decided to be a music producer. And now I compose and record music for film, multimedia and art-projects. To me it is important to have a simple set-up, just for recording my harp, because I am not a technical person. Some acoustic absorption material, 3 mics, a good audio interface device and a laptop to make things work. I record with 2 Neumann microphones, an Ischell contact mic and a strong laptop, excellent cables and a pedal harp. I play a Lyon and Healy double action harp. I chose this instrument for its amazing sound and ergonomics, while it is less heavy than other harp brands. Plus my harp has a great resonance, she is very even sounding in the width, high and bass – this balanced sound is great for the harp recordings. Other harp brands have a pretty defined sound which will be more so when the harp grows older but this particular brand is less defined so it allows me to make the sound of the harp my own. Composing, improvising starts idealistic with surrendering in silence and then going with the flow and of course my harp. The connection with my 47 strings is the basis for all my productions. I have a very cool and yet intimate workplace where I feel very comfortable to make music. I love that I can make recordings in my own place at my own time and when I feel like it. Mood cannot always dictate work; when I have a deadline for a project for example then I really need to sit down and work as long as it takes to get the job done. It took me a while to have a steady recording set-up. I needed to learn about acoustics – how to place the mics – what kind of mics are the most effective in my room. It gives relief not to worry about the laptop crashing or the mics giving noise anymore (one can imagine that it is quite mood killing to record with an unsteady set up). When my gear work as it should I have the best job ever ! The piece “Where's Mo?” is very dear to me. This original harp solo changed into a duet with trumpet. I work with the recorded harp as basis material for my compositions. (To me it is important that the harp solo can stand on its own.) Then I record the other instruments sound on sound. The musicians I work with are selected because they are able to give a strong musical answer to my monologue. Saskia Laroo (trumpeter) did not want to hear my composition beforehand. In the recording studio she put on the headset and as soon as she first heard my harp-sounds she started improvising beautiful and touching music. Composing is such an intuitive process. Sometimes I hear a melody and then play it on my harp and most of the times it immediately becomes a basis for a free improvisation. Sometimes a composition arises through improvisation, some brain work and choices. I listen and re-listen until the composition sounds right, either I need to delete some notes or maybe I need to make a stronger melody … or the pulse – heartbeat of the music is not there yet ... again I trust my gut-feeling in this refining and creative process. I am dedicated to record my harp as good and beautiful as possible, because I feel drawn to the acoustic sound of the instrument. At the same time I like it a lot when a remixer takes my harp-sounds and combines or tweaks my harp into a new digital sound. I love it how my music evolves creatively and gets a new set of wings this way. Every day I am on a sound search. My instrument still surprises me when it comes to timbre. It is actually a strong sense of urgency to translate and express the various (harp)sounds into a cinematic imagery. My current harp I chose as my music companion because it doesn't have a defined sound, this instrument allows me to actually shape the tones as it were (I realize that I am talking about subtleties). The sound, dynamics, timbre I create with my fingertips and where I decide to place my fingers. I can make flageolets – overtones created by shortening the string by the palm of my hand, the string will sound a quint or octave higher depending of the placement of the hand. A more guitar-like sound can be reached by playing “pret de la table”. Or I can prepare my harp with paper-clips hanging in the strings that give a particular sound. These different techniques and many more can be used when I would like to have “effects” in a composition. I like to see my music productions as sound-sculptures (tridimensional); I intended to create a scenery where you can walk around the notes as it were. The sound-quality of the harp recordings and the musical architecture are crucial to make my compositions work and they remain my ultimate tone colours. The harp - the purest of all instruments - has an unique timbre and blends particularly well with the sounds of nature and spoken word. My 47 strings complement other instruments and other art-forms because of its natural tone that is never predominant and at the same time very colourful, sometimes orchestral sounding indeed. "I compose landscape music; subdued and stilled music that reflects the internal and external landscapes we are moving in."